From Cochin he came to Trivandrum where my father (Prof. K. Sundararama Iyer) and I were at that time. He brought with him a letter of introduction from Cochin to my father at Trivandrum. My father was then the tutor to Prince Martanda Varma of Travancore at Trivandrum. My father's services had been lent by the Madras Government to the Travancore Government. I passed my Matriculation in 1892 and joined the Maharaja's College, Trivandrum, for the Intermediate class. It was at this juncture, towards the end of 1892, that fate threw me into Swamiji's holy company. Swamiji was then unknown to fame but felt a great urge to spread Hinduism and spirituality all over the world, One morning while I was in my house he came unexpectedly. I found a person with a beaming face and a tall, commanding figure. He had an orange-coloured turban on his head and wore a flowing orange-coloured coat which reached down to his feet and round which he wore a girdle at the waist. Swamiji asked me, "Is Professor Sundararaman here? I have brought a letter to be delivered to him." His voice was rich and full and sounded like a bell. Well does Romaini Rolland say about the voice, "He had a beautiful voice like a violoncello, grave without violent contrasts, but with deep vibrations that filled both hall and hearts. Once his audience was held he could make it sink to an intense piano piercing his hearers to the soul." I looked up and saw him and somehow in my boyishness and innocence (I was only fourteen years old at that time) I felt that he was a Maharaja. I took the letter which he gave and ran up to my father who was upstairs and told him, "A Maharaja has come and is waiting below. He gave this letter to be given to you." My father laughed and said, "Ramaswami! What a naive simple soul you are! Maharajas will not come to houses like ours." I replied, "Please come. I have no doubt that he is a Maharaja." My father came down, saluted Swamiji, and took him upstairs. After a pretty long conversation with Swamiji, my father came down and said to me, "He is no doubt a Maharaja, but not a king over a small extent or area of territory. He is a king of the boundless and supreme domain of the soul." Swamiji stayed in our house for nine days at that time. My father has described his impressions of that period in an article entitled "My first Navaratri with Swami Vivekananda". I shall set down here briefly the indelible impression left on my mind by Swamiji's words to me during that memorable visit of his to our house at Trivandrum. He said, "The important words in this verse are devatatma (ensouled by Divinity) and manadanda (measuring-rod). The poet implies and suggests that the Himalaya is not a mere wall accidentally constructed by nature. It is ensouled by Divinity and is the protector of India and her civilization not only from the chill icy blasts blowing from the arctic region but also from the deadly and destructive incursions of invaders. The Himalaya further protects India by sending the great rivers Sindhu, Ganga, and Brahmaputra perennially fed by melted ice irrespective of the monsoon rains. Manadanda implies that the poet affirms that the Indian civilization is the best of all human civilizations and forms the standard by which all the other human civilizations, past, present, and future, must be tested. Such was the poet's lofty conception of patriotism." I felt thrilled by his words. I treasure them even to this day, and they shine in my heart even now with an undimmed and undiminished splendour. On another of the nine days, he said to me and my father, "Practical patriotism means not a mere sentiment or even emotion of love of the motherland but a passion to serve our fellow-countrymen. I have gone all over India on foot and have seen with my own eyes the ignorance, misery, and squalor of our people. My whole soul is afire and I am burning with a fierce desire to change such evil conditions. Let no one talk of karma. If it was their karma to suffer; it is our karma to relieve the suffering. If you want to find God, serve Man. To reach Narayana you must serve the daridranarayanas — the starving millions of India." That was the root from which came the great tree of the Ramakrishna Mission later on. His words melted our hearts and kindled in our souls the flame of social service. Thus service was as dear to him as spirituality. In his later life, in a memorable letter (to Mary Hale, July 9th 1897.) he exclaimed, "May I be born again and again and suffer thousands of miseries so that I may worship the only God that exists, the only God I believe in, the sum total of all souls: and, above all, my God the wicked, my God the miserable, my God the poor of all races, of all species, is the special object of my worship." We seem to hear in these passionate words the voice of Rantideva himself. On yet another day Swamiji told me, "You are still a voung boy. I hope and wish that some day you will reverentially study the Upanishads, the Brahma-Sutras, and the Bhagavad-Gita which are known as the prasthana-traya (the three supreme sources of Truth), as also the itihasas, the puranas, and the agamas. You will not find the like of all these anywhere else in the world. Man alone, out of all living beings, has a hunger in his heart to know the whence and whither, the whys and wherefores of things. There are four key words which you must remember, viz abhaya (fearlessness), ahimsa (non-injury), asanga (non-attachment), and ananda (bliss). These words really sum up the essence of all our sacred books. Remember them. Their implication will become clear to you later on," I was too young then to grasp all these ideas in full. But I gladly laid those lessons to my heart and have tried all my life since then to learn them in their fullness. ...Swamiji reached Madras in the beginning of February 1897. Remain Rolland's description of the grand public reception accorded to Swamiji at Madras is perfectly accurate and I can vouch for it as I myself was an eyewitness. He says, "Madras had been expecting him for weeks in a kind of passionate delirium. She erected for him seventeen triumphal arches, presented him with twenty-four Addresses in various languages of Hindusthan, and suspended her whole public life at his coming — nine days of roaring fetes. "He replied to the frenzied expectancy of the people by his Message to India, a conch sounding the resurrection of the land of Rama, of Shiva, of Krishna, and calling the heroic Spirit, the immortal atman, to march to war. He was a general, explaining his 'Plan of Campaign' and calling his people to rise en masse." I was one of the delirious hearers and admirers of Swamiji. I had by that time passed the B.A. Degree examination from the Kumbakonam College and had joined the Law College at Madras. At that time studies in the Law College were not heavy, the classes being held for two hours every evening, between 5 p.m. and 7 p.m., in the premises of the Presidency College, Madras. The Law students and the Medicos have always been a keen and valiant group. I and my friends went to the railway station at Egmore on the day Swami Vivekananda was expected to reach Madras. A carriage, to which two horses had been yoked, was kept waiting for the Swami. He was to be taken in procession to the Castle Kernan on the beach, where Swamiji stayed for nine days. We saw at the station a sea of human faces. Shouts of "Jai" rent the air when the train carrying Swamiji was sighted. He got down from the train and made his way slowly to the carriage. When the procession had wended its way for some time, I and some others insisted on unyoking the horses and dragging the carriage ourselves. The horses were unharnessed, and many of us started pulling Swamiji's carriage, and, walking slowly, we covered a long distance before reaching the destination. We were perfectly happy as we had achieved our hearts' desire. To us Swami Vivekananda was "India incarnate" and God's holy messenger. During all the nine days of his stay at Madras I was with Swamiji for most of the time. Throughout all the days there was a never-ending stream of visitors. Many silently sat near him and listened to his words. Some discussed momentous matters with him. A few intimate persons, among whom were some of Swamiji's friends and admirers, discussed with him his plans for future Vedanta work in South India. I was constantly with Swamiji, who had recognized me and recalled his visit to our house at Trivandrum in 1892. I can never forget his eyes which brightened up with a new light and his mobile lips which shone with a divine smile whenever he saw me sitting just in from of him. My father, Professor K. Sundararama Iyer, was also in Madras at that time and met Swamiji several times. He has left on record his memories of Swamiji, during the latter's stay for nine days at Madras, in a lengthy article entitled "My second Navaratri with Swamiji". The difference that I noticed between Vivekananda of 1892 and Vivekananda of 1897 was what struck me most. In 1892 he looked like one who had a tryst with destiny and was not quite sure when or where or how he was to keep that tryst. But in 1897 he looked like one who had kept that tryst with destiny, who clearly knew his mission, and who was confident about its fulfilment. He walked with steady and unfaltering steps and went along his predestined path, issuing commands and being sure of loyal obedience. 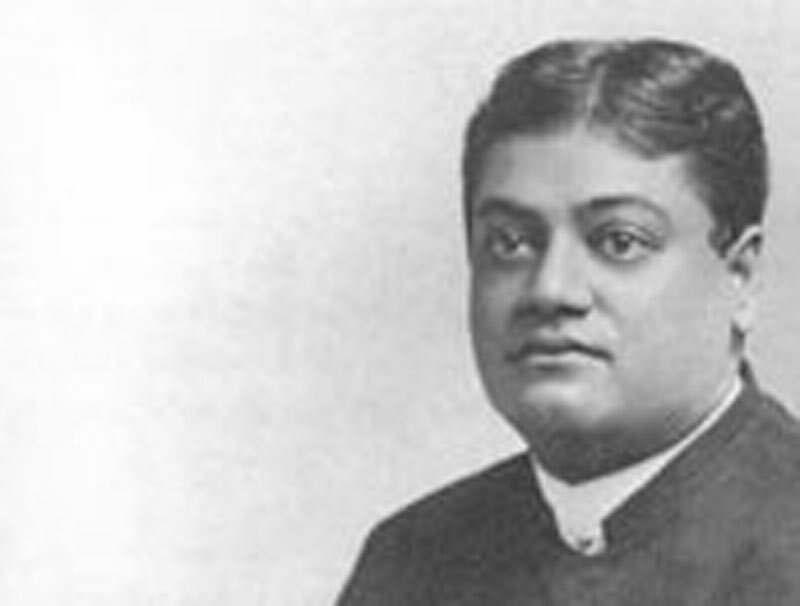 One other experience which I had in 1897 was my hearing the songs sung by Swami Vivekananda. That he had a musical voice was already experienced by me in 1892. That his songs had the power of transporting Shri Rarnakrishna Paramahamsa into ecstasy became known to me much later only. During the nine days of his stay at Castle Kernan we heard him sing a few of the Ashtapadi songs of Jayadeva, from the famous devotional lyric poem Gita-Govinda. The mode of singing these lyrics in Bengal was evidently different from that adopted in South India. Vivekananda's melodious voice left a lasting impression on my mind. Swami Vivekananda's first public lecture in Madras was on "My plan of campaign" and made a profound and indelible impression on me .... I felt thrilled to the innermost core of my being by his words and my eyes were wet with tears. Many others who heard the speech were in the aame predicament. Then and there some of us look a vow to do what we could to relieve the ignorance, poverty, and misery of the masses of India to the extent possible for each one of us. Yet another lecture by Swamiji was on "The Sages of India". It also made a deep impression on my mind. In conclusion, I wish to refer to the unique experience which I had in May 1952. I was then on a pilgrimage to holy places in North India. It was my privilege and happiness to spend some hours in the Ramakrishna Math at Belur, near Calcutta. The kind Swami who took me round the Belur Math led me eventually into the room where Swami Vivekananda spent his last days. Ordinarily no visitors are allowed inside the room. But the Swami who took me there said: "In your case we gladly made an exception as you contacted Swamiji early in your life and have been like your honoured father, an admirer and follower of the Ramakrishna Mission all your life." I entered the holy room with deep devotion and bated breath. It overlooks the river Ganga (Hooghly). The room throbs with an atmosphere that is sacred, solemn, and serene. I drank with brimming eyes the beauty of the grand view from the room and deeply felt the holiness of the place. I sat there in meditation for a while, thinking of Swami Vivekananda and of his peerless services to India, to Hinduism, and to the cause of spirituality all over the world. While inside that room where Swami Vivekananda once lived, I felt that the divine flame of spiritual knowledge (jnana-dipa, as referred to by Shri Krishna in the Gita), was lighted in my heart.